Romantic, full of feeling and a passion for dance. This story kept me turning the pages. I loved Bri's grace and innocence, and her determination to find out about her past. Drake was a bit of a bully in the beginning, but he grew on me. Once he realized what was important, he showed his true colors. There are several wonderful secondary characters, as well as a couple not-so-nice ones. I felt the love of dance through both Bri and Drake's eyes and feelings. I highly recommend this story. This is my unsolicited review. I absolutely loved this story. The time period, the charachters , everything about it. The rule breaking Duke, the lower class performer made for engaging reading. Drake has staked everything on his ballet house and this opening performance. Touting the premiere balerin from France, he is shocked and maddened to find out her understudy has been sent. But one viewing of her dancing is all it takes to heighten his curiosity. And their first kiss only magnifies she is like no other. Instant passion, instant fire only makes it harder to stay away. Bria has to make this show perfect. She knows she's good but can she carry the show? After meeting Ravenscar and his imposing height, she is a bundle of nerves. But attracted as she's never been before. But she has other reasons for being in England also. To find out who her mother ad father are. With only a portrait to go on she must be careful. As Drake becomes closer and closer to Bria the more smitten he becomes by her. She refuses to be his mistress. Has made it clear she will never be any mans mistress but he wants more. But his station keeps his mother on his case to find a proper and suitable wife. But with Bria there can be no other. She is the one for him. Now to as her see it too. As Bria's infatuation grows to a strong love, the love of her performing keeps the house full night after night. But with her inquiries into her birth secret messages, threats really a re becoming a real fear. Is she onto something. As things are drawing to a close and it is nearing time for her to leave, the dangers reach epic proportions and her life my be ruined. Can anyone save her? Will Drake come fr her? Can she really b who sent finds out she is?? The mystery reveals itself and it was stunning to see where Bria really came from. Loved this story!! London 1833 As I turned the last page of this wonderful story, I could only smile and be glad I read the entire book through this afternoon. Amy Jarecki has ventured into Georgian England, while expertly combining her historical knowledge with romance and intrigue to bring two unexpected people together. Drake, Duke of Ravenscar had invested a fortune in a London theater and intended to bring a famous ballerina and her troupe for the opening weeks. But instead he gets her understudy who has yet to prove herself. He is so angry and knows that the theater will fail without the lead ballerina. Britannia LeClair takes the role and wants only to give her best and make her debut. A foundling, she is determined to find her birth parents who had given her up long ago. She only had a couple of clues but has puts out inquiries when she gets to London. When they lock eyes on each other, there is a definite spark and as Drake sees her dance, he is truly mesmerized. But danger lurks as Britannia receives threats and accidents that were not really accidental. Step back in time and lose yourself in a story that will keep you turning the pages as fast as you can. I truly cannot wait for more in this series and you will love it too!! By Amy Jarecki The Duke of Ravenscar had intended on having the most acclaimed ballerina in the civilized world to open his theater however sometimes things don't always go as one would want them to. When the ship arrives it has only an understudy and Drake is convinced the fortune he has invested in his theater will be forfeit. That is until he sees the understudy dance. Britannia LeClair arrives in London more then excited to be performing the lead in La Sylphide. As a foundling she has had to work harder than anyone in the corps. At last as her debut in London proves her worth despite her lowly birth. Then she meets the smoldering gaze of the Duke of Ravenscar. Britianna is determined not to become anyone's mistress she keeps the Duke at arms length while she trys to uncover the mystery of her parentage. She only has a miniature painting and a monogrammed hankercheif to make her inquiries by and they lead to a series of escalating accidents and threats to her life. When Drake realizes Britannia is in danger, he will do anything possible to protect her. That is if Britannia will let him. As they traverse through the mire of skulduggery and hidden shame, events will unravel and endanger them both. Will the truth prove worth uncovering, or will it sever the deep love that has come to bond their very souls and bring them ever closer. This is Amy Jarecki's first time writing Georgin History and it was incredible. I was hooked from the minute I picked up the book to the very end an end. An end that I was sad to see. Ms Jarecki's characters were fresh and I adored most of them. As I read the words it was like watching a motion picture of the book. I could actually see the Dukes beautifully bright blue eyes like they were in front of me and I could see Britianna doing ballet up on stage. This was a novel that had so many unexpected twists and turns that I was constantly amazed. 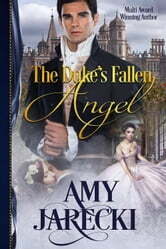 I would highly recommend this book to historical romance fans everywhere.